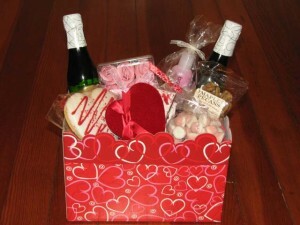 Surprise your Valentine with a cure box full of Fredericksburg delight from Fredericksburg Basket Company. Rose soap petals for your bath and luscious lotion from Bath Junky along with peppermint bark and a decorated heart sugar cookie from Clear River, Strawberry and Cream Gummies, Maple pecans from Nature’s Candy, a bar of Chocolate from El Rey, and a beautiful velvet heart box with three truffles from Chocolat will start your weekend of love! A card will be included with your message. Cost: $50. Add champagne for on $15 more. Call Fredericksburg Basket Company at 830-456-9620 to order! Only 24 baskets available!